Weddings are a crazy, incredible and hectic time in the lives of any bride and groom as well as their immediate family. The rehearsal dinner is like a deep breath before the plunge. It gives everyone a chance to relax and celebrate before the big day. We think that Dearborn is one of the loveliest and most exciting places in Metro Detroit. We may be just a little partial, but we’re excited you’re looking for a rehearsal dinner venue in our city. These events can be anything you want. Most people choose a more casual feel to give those involved the opportunity to kick back a little. But why not think outside the box? Reserve a shelter at a local park. Or if you prefer a competitive edge to your celebration, try a completely nontraditional option like a local bowling alley. 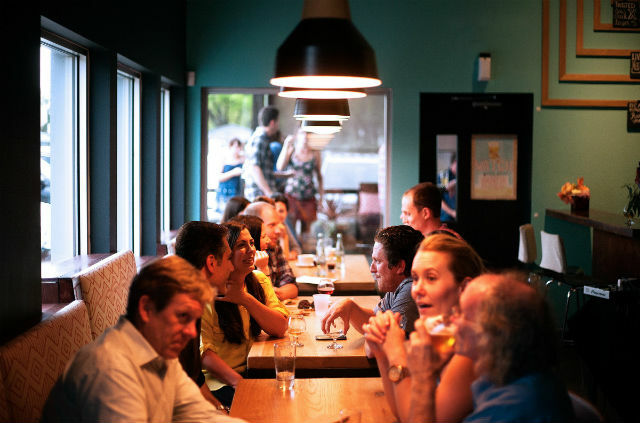 Many brides and grooms prefer to have their rehearsal dinners at restaurants. After planning an elaborate wedding, it’s nice to pass off the details of this event to competent professionals. Restaurants often have dedicated party spaces which make them the best locales for these types of parties. 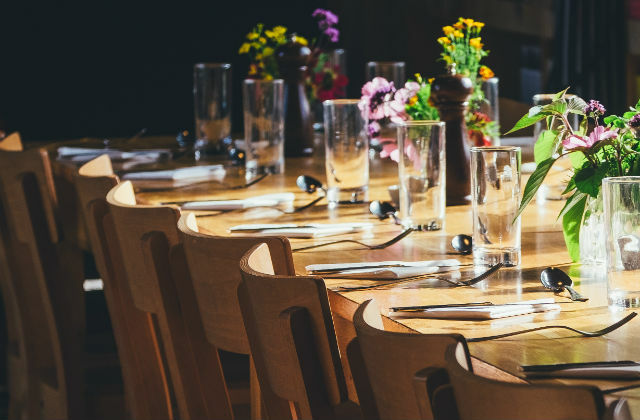 If you’re thinking about hosting a rehearsal dinner in Dearborn or Metro Detroit, here are our picks for the top seven rehearsal dinner venues. If your friends and family love seafood, they will adore Dearborn’s Big Fish Seafood Bistro. A raised portion of the restaurant allows you and your party to enjoy a private dining experience at this popular location. There’s room for about 40 people — and a partition gives your group privacy and cuts down on noise. Pick a starter from their soup, salad and appetizer selections. Big Fish is famous for their chowder — a decadent bisque with large chunks of seafood. They also have oysters on a half shell, scallops and even a seafood platter which allows your guests to sample an assortment of yummy options. And for those who prefer land-lubber meals, there’s steak and pasta as well. Click here to contact Big Fish about your event. L.A. Bistro is an Italian eatery with an urban backdrop. The restaurant is in downtown West Dearborn, with views of Westborn District’s busy streets. They offer an intimate experience with memorable and delicious dining options. They can accommodate groups of 20 or more and will work with you to establish an incredible menu. Their simple and elegant Alcapress is an excellent way to start. Then you can move on to a succulent entrée — pasta, seafood, chicken or steak. L.A. Bistro is pure indulgence on a plate. To learn more, click here for reservation information. Looking for an upscale atmosphere? Mint 29 is a fashionable locale which will impress any guest. Housed in the historic federal bank built in 1929, this location offers a unique backdrop for your event. Rustic elegance best describes the décor and feeling you get when you walk through the doors. Their menu is seasonal, so you will need to work directly with the staff to figure out a fresh and exciting menu selection. They’re well-known for exotic salads and surf and turf entrees. Choices range from braised tenderloin tips with wild mushrooms to salmon glazed with Korean barbeque sauce. If you would like Mint 29 to host your party, click here. Working with locally sourced ingredients as well as exclusive Italian vendors, Osteria 222 is a unique American and Italian fusion restaurant. Your guests will love their sumptuous meals, which include hand-rolled pastas and signature sauces. Their pizzas are crafted using flour imported from Naples and luscious tomatoes grown in volcanic-rich soil. Osteria’s Grotto Room is a large space that can sit up to 100 guests. It has a private bar and fireplace — and when weather permits, your guests can relax outdoors. They work with you to perfect a menu selection. They provide entertainment options and allow audio/visual capabilities. Treat your guests to music or even a slideshow of the bride and groom. Click here for more information about Osteria 222 and the Grotto Room. Lovett Hall: For a touch of panache, Lovett Hall is a sophisticated ballroom with an air of elegance. Greenfield Village: For a casual and quaint experience, there’s nothing quite like Greenfield Village. This living time machine takes guests on a stroll through history and is available for open-air picnics and dinners. Henry Ford Museum: If you’re looking for something even more distinctive, try the Henry Ford Museum. It’s filled with interesting historical artifacts and inventions. Ford Rouge Factory Tour: To pay homage to Dearborn’s automotive history, you can even host your event in the Ford Rouge Factory Tour. Whichever venue you choose, the staff will work with you to create a tasty and inventive menu. Dearborn’s most raved about hotel is available for functions of any size. The Henry, Autograph Collection is known for its sophisticated spaces, impeccable service and delicious dining. This hotel provides the perfect locale for a rehearsal dinner. If the party goes well into the night, you can stay over in one of their luxurious guest rooms or suites. No matter how big or how small your party size, the Henry has 12 different ballrooms you can rent for your event, and each is outfitted with audio-visual capabilities. Be sure to take advantage of this technology to show your guests pictures or videos about your love story. Intimacy is key at TRIA — that and incredible dining! If you’re looking for a comfortable yet chic venue, TRIA, located in the stately Henry Hotel, is waiting to serve you. Your guests will be impressed with the incredible service, beautiful ambiance and the food. TRIA is a staple in the Dearborn cuisine scene as well as a must-do in Metro Detroit. Not only do we highlight local and sustainable dining, but our food also epitomizes contemporary American cooking. When planning your rehearsal dinner at TRIA, you will work with our culinary team to choose options from our incredible menu. This includes favorites like House-Pulled Smoked Mozzarella, Caraway Dill Seared Salmon and other entrée or small plate selections. However, if you have dietary restrictions or individual requests, we can work with you to create a unique menu for your party. An intimate gathering at TRIA is guaranteed to have three things: fantastic food, impeccable service and an experience that you and your guests will treasure. If you would like to start planning your rehearsal dinner at TRIA, click here to contact us.